Sasaki Time: The Ultimate Jello Shot Recipe List! Here is the Ultimate Jello Shot List! Good Luck! Have Fun! Drink Responsibly! 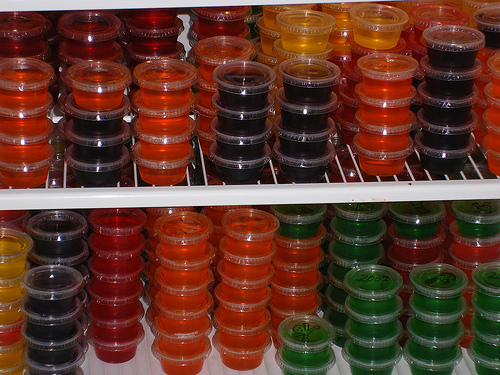 There are 70 jello shot recipes here! 4 *MIMOSAS* this one varies from the normal method Since champagne isn't as strong as liquor, cut the water out of this one. boil one cup champagne, mix orange jello 2 min, add one more cup champagne and a splash of OJ. 59 LONG ISLAND ICED TEA and measure 1 cup of boiling water. Dissolve 2 packages of Lemon Jello (3 oz) and stir until fully dissolved. Add 1/2 cup of Cola and 1/2 cup of cold water. Now get ready to add the alcohol - 1/2 cup of Gin, 1/2 cup of LightRum, 1/2 cup of Vodka and 1/2 cup of Tequila. Stir until everything is well combined and let it cool before pouring into jello shot cups. FYI - Make sureyou know who made the Jello Shots. My daughter recently was in the hospital because the person who made the shots added dissolved pain killers. It was codine, which did not mix well with her other meds. THe kids are calling it "Lean". Just a headsup to be careful!